Comparing 50mm lenses from 1978, 1991 and 2018 shows how much things have changed in the photography world in recent years. The first things quickly becoming obvious when comparing the SMC Pentax-M 50mm F1.4, the SMC Pentax-FA 50mm F1.4 and the HD Pentax-D FA* 50mm F1.4 SDM AW (apart from the lengthening of lens names), is that the M and FA lenses are more similar than different, while the D FA* stands proudly apart. While the M and FA propose different finishes (metal vs plastic) and different focus means (manual vs autofocus), they share a lot of elements. The body size and aperture ring are common to both. The optical performances are also comparable, if not identical. Their resolution figures are generally comparable, although contrast is improved on the FA. The D FA* easily outpaces both older lenses in all conditions, but particularly in the corners. Rarely have we tested a lens capable of such sharpness. Vignetting is one area where the FA visibly improves over the M. Here again, the D FA* is even more of an improvement. Aberrations again show more similarities than differences between the two older lenses. Especially with corner illumination, the D FA* handles ghosting and flare better than the M and FA lenses. Chromatic aberration is comparable for the two older lenses, and here also the D FA* delivers improved results. Bokeh is one area where improvements over time are more subtle. Each iteration brings improved results, but even the older M lens delivers pleasing out-of-focus blur. Distortion, for its part, shows progressive improvements with each design. The D FA* produces images that are nearly distortion-free, something almost never seen. Focusing with the D FA* is blazing fast. That's no surprise for the new Pentax flagship lens. What is surprising is just how good the FA can be, even in low light. While the M and FA lenses share many things, especially regarding their appearance, the D FA* clearly stands apart. Gigantic in comparison, heavier than many consumer zooms, weather resistant and featuring silent AF, the D FA* is a brutal statement that a no holds barred approach was selected when designing it. It is meant to offer the best optics currently available on K mount, whatever the impact on size and weight. And it delivers. This is a lens with almost no optical weak points and all-around excellence. The above analysis stands whether we use the lenses on full frame or APS-C cameras. As can be expected, all optical flaws are more obvious on full frame but cropping to APS-C size does not change how the lenses compare to one another. In 1978, Pentax created a 50mm lens which, despite a few flaws, can still hold its own optically with many recent lenses. In 1991 they brought incremental improvements to this lens and produced a lens still well-regarded today, so much so that it's still available new. In 2018, 40 years after releasing the M 50mm, the company created a small revolution with what might be, technically, their best lens yet produced. The M 50mm F1.4 is not available for purchase new. The FA 50mm F1.4 can be bought for $319.95 while the D FA* 50mm F1.4 sells, as of February 2019, for $996.65. Ratings are format-specific. Handling will be influenced by the lens dimensions and weight, in particular for smaller APS-C camera bodies. The saying goes that everyone needs a fast fifty. While this can be argued, the M 50mm F1.4 makes a good entry point for anyone interested in this focal length. Regularly available on the used market, it is an inexpensive way to acquire a fast aperture lens. The FA 50mm F1.4 is a compelling choice since its relatively low price lets the user acquire a fast lens with good optical capabilities. 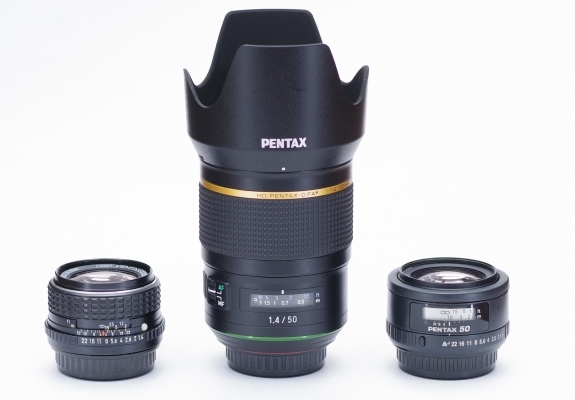 Sometimes there is no substitute for a wide aperture and F1.4 is currently the widest available new from Pentax. The D FA* 50mm F1.4 is three times as expensive as its FA counterpart. Is it three times as good? Hard to say, but it is certainly worthy of being considered the flagship lens of the K mount in 2019. 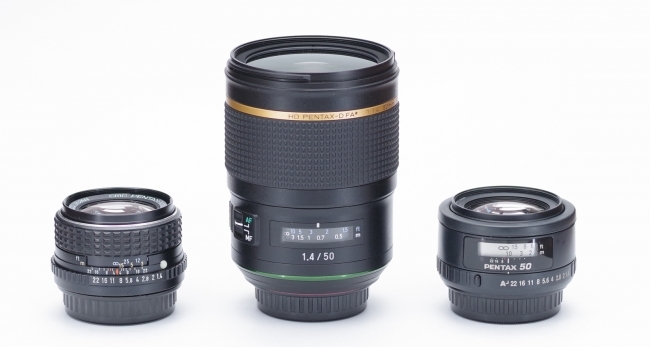 Be sure to check the user reviews of the M, FA and D FA* 50mm F1.4 or post your own if you already own these lenses.